I found the Audible version of this book, quite entertaining. An American family moves into a haunted house in England. The boys in the family play tricks on the ghost, and make him feel he has no worth as a ghost. The young girl in the family is kind to the ghost, and ends up helping him. 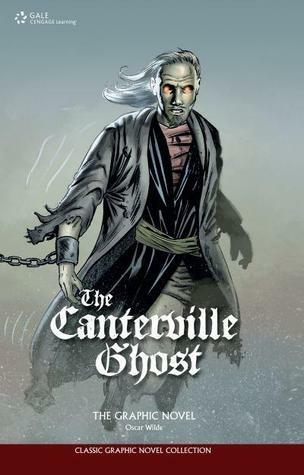 This is a well illustrated graphic novel version of the original Canterville Ghost. It has some great pictures and most especially, stays pretty loyal to the original. I had to go obsess and compare the two, and there are a few lines missing, but nothing substantial. The mood and humor are preserved quite well. I would probably feel like I had to 'help' a youngster who read this, because a few jokes are historical prods at the cultures and countries of the time. Perhaps a little history lesson might be in order, or the kid can just have it pass right over their head so they can 'get it' at another day and age. A satisfying read for a Sunday afternoon when it is too rainy to want to do anything but brood. This graphic novel provides the reader with a brood that is self deprecating, and that helps keep brooding in its place. Geez, do I sound like an optimist or what? I am a firm believer in controlled brooding, what can I say?As a side note, I was rather disturbed to discover that there are three levels to these 'classics' graphic novelizations. Apparently you can get a classic with the original story and words, or a classic with SOME of the story and words, or you can get a brightly colored action packed graphic novel of a classic with very few words, one sentence apparently substituted for whole paragraphs. WHY??? Let the kid who can hold a graphic novel have stuff go over their head! It makes 'em hungry for the next level. Or, they get to discover the next level quite by accident when they go back and reread. I didn't know these levels existed when I got this book- I'm glad that I have one true to the story. This is the first graphic novel I have read, having really no interest in graphic novels at all. It probably wasn't the best choice I could have made as I would much rather read classic literature in tried and true literary form, but given all of that, I liked it. It seems to be part of a series of literary titles published by Classical Comics in graphic form to gin up student interest in the classics. The story is a parody on the gothic genre so popular in Oscar Wilde's day. It turns the typical ghost story upside down and puts the ghost on the defensive. It is also a commentary on upper crust British society vs. nouveau riche, materialistic Americans. Really the only problem I had with the graphic version was the graphics! Particularly Virginia who was seemingly supposed to be a sweet slip of a thing but was drawn like a tank. I will have to read the actual short story to make any other comparisons. There is quite a bit of information in the appendices of the book; a brief bio of Oscar Wilde and some other useful and interesting support material. I have since started a graphic novel that was meant to be a graphic novel - Amulet, Vol. 1: The Stonekeeper by Kazu Kibuishi which might be a better testing of the waters for me. We'll see if I am motivated to read the entire series! This must be one of the best graphic novels of a story of Oscar Wilde so far! Unfortunately in this edition there were a few words missing in the speech bubbles. But otherwise an excellent adaption of the story. It's so good I will add it to my buy list! I don't know if this will be readily agreed with, indeed many may find it offence, however, I have to say in a strange sweet way in the two chronological look at Oscar Wilde's life the trials and imprisonment are not even mentioned. I say this is a positive because to my view point it shows that he was actually someone to the world and should be remembered as such before he was convicted. Others may not see it this way and cry it is covering up his sexuality and were the printers ashamed etc. etc. But if anyone who reads this book and is inspired to learn more let them do it themselves. When other books have mentioned this aspect of his life they insist on painting him as a tragic figure and that his life was almost meaningless until he was sent to prison. By not mentioning it here the publisher may be saying let everyone make up their own minds! Of course I may be wrong about this, however, these were my thoughts when I noticed the non-mention in this book. Well done tho' to the illustrator and the script writer! I found this story to be absolutely hysterical! Despite his greatest efforts, the Canterville ghost just can't seem to scare anyone. No amount of blood on the floor or the rattling of chains will do the job. Frustration grows within the ghost as he falls victim to ghoulish pranks played by humans. The graphics in this comic are superb I defintely reccomend this book to anyone who would enjoy a ghost story gone awry. I've given other classical literature the graphic novel treatment; this one didn't quite live up to my expectations, but was decent enough for the 45-minute read. Some speech bubbles are missing letters which made the reading a bit weird, but the art was nice. If you've read Oscar Wilde's original you may be disappointed. If you've watched the movies you might like this better. 2.5-3. I like the Classical Comics series of graphic novels and Oscar Wilde. Great story in full color and some biographical information at the end. One of the first horror/comedy mixes to come out. I'm not familiar with the original story by Oscar Wilde, so I cannot comment on the story itself (but my guess is that I would not have liked it). I LOVED the speed at which you can read a graphic novel AND I loved the graphics. I think I will try some others, hopefully with a better story line. A great modern graphic novel adaptation of a classic gothic horror comedy! Read along-side the Kindle edition to make sure I wasn't missing anything. Only a few sentences here and there were missing (made unnecessary by the artwork) from the graphic novel. A very throughly enjoyable read, loved any mixture of it. Well... I must say that the graphic novel misses the point slightly. It is about the contrast between old British values and modern American ones, but it just does not get there. It lacks. Sean Michael Wilson Oscar Wilde Gale Cengage Learning - Sean Michael Wilson is a comic book writer from Scotland. He has had around 30 books published with a variety of US, UK and Japanese publishers, including: a comic book version of A Christmas Carol ('Best of 2008’, Sunday Times), AX:alternative manga ( 'Best ten books of 2010’, Publishers Weekly), Parecomic (with an introduction by Noam Chomsky, his first contribution to a book in graphic form). He is currently writing books for big Japanese publisher Kodansha, being the only British writer to do so. In fact, he is the only pro manga writer from Britain who lives in Japan. He is also the editor of the critically acclaimed collection 'AX:alternative manga' (Publishers Weekly's 'Best ten books of 2010' and nominated for a Harvey award). Working with various Japanese artists he has written a unique line of Japanese history/martial arts/Samurai books, including The Book of Five Rings, Secrets of the Ninja, The 47 Ronin, and Cold Mountain (winner of China Comic and Animation Competition 2015 ‘Best Overseas Comic’ award). In 2016 his book 'The Faceless Ghost' was nominated for the prestigious Eisner Book Awards, and received a medal in the 2016 'Independent Publisher Book Awards'. In 2017, his book Secrets of the Ninja won an International Manga Award from the Japanese government - he is the first British person to receive this award. His main influences remain British and American creators - such as Alan Moore, Grant Morrison, Eddie Campbell and Harvey Pekar. He often gives lectures and talks about comics in schools and colleges, and writes articles for such places as The Japan Times, The London Economic and The Herald Scotland.